Most weeks, I’ll complete a minimum of 2-3 books. My RSS reader is filled with great blogs I keep up with daily. I don’t miss an episode of a few podcasts. I’ve learned a lot through this constant influx of information. But just because this information is convenient, doesn’t mean it’s the best way to learn. The purpose of this post is to explore alternative methods to learning besides absorbing information. Here are 5 simple ways anyone can take their education beyond absorbing information. One of the primary reasons I started Gen Y Wealth was to teach what I was learning to pass the CERTIFIED FINANCIAL PLANNER® exam (which worked). Now the exam is long over, I continue to write about topics I want to learn about. Topics that interest me right now are behavior change, psychology, and travel hacking. As you know, these are the primary topics I’ve been posting about lately. Teaching others what I’ve been learning isn’t only a very rewarding experience, but helps me understand how to apply what I learn to my life. When I was setting my learning goals, one goal was to spend 30 days outside of the U.S. I don’t need 90% of what I own. Experiences really do make you happy. Money is the easiest excuse of all not to do something (i.e…not being rich isn’t an excuse not to travel)..
A better understanding of world history, religion, art, music, cultural values, and politics. One of the most important skills I’ve learned through Gen Y Wealth is time management. Not long ago, I wasted a lot of time. I played so much xBox, I ranked in the top 100 in the world in Madden. It wasn’t until I started my own business, while working full-time on another job, that I realized how important and valuable time is. If there’s a subject you love to learn about, start a business around it. Why not profit from your passions? Another option is to become an apprentice. Look for someone whose skills and values you really respect. Carlos Miccelli, the man behind the blog OwlSparks, become an apprentice for Josh Kauffman of the Personal MBA. If you don’t know of anyone to hire or work under, Score.org has over 13,000 small business owners around the U.S. who have volunteered to help other entrepreneurs. You can work via email. phone, or face to face. For over two years now, I’ve met with a group of local entrepreneurs. We get together once a month to share our goals, projects, what we’ve learned, and offer advice to one another. The experience has been tremendous and it’s something I plan on continuing. There are many ways to find like-minded people locally. I found my group through an online forum. A great website for finding local groups is MeetUp.com. Meeting others face to face has its advantages but isn’t required. I spend a lot of time in the Flyer Talk | Miles Buzz Forum to see how others are earning and spending miles. I admit, I’ve just lurked around. If I really wanted to learn quicker, I should start answering others questions. The goal is to start talking about what you’re learning with others. It’s one of the quickest ways to shorten your learning curve. In the comments, what better ways to study have you found? If this free post was helpful, do you mind helping me out by taking a second to retweet, stumble, or share this post on Facebook? Thanks! These are great ideas. I would love to combine these things, like teaching as a business while traveling. 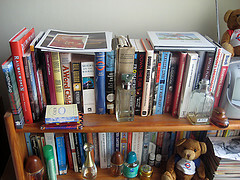 I read books and blogs too, and it can be information overload. Sometimes you have to give that information to others!